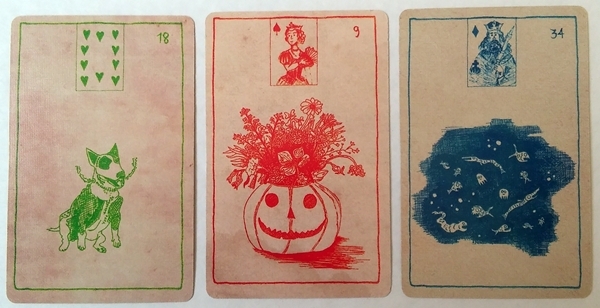 Spooktacular Lenormand is a delightful Halloween-themed Lenormand deck by Wandering Oracle. The cards measure 2.25" x 3.5". They are printed on sturdy cardstock that is easy to shuffle. The backs feature Autumnal multi-colored bats, suiting the deck perfectly. The cards have thin inner borders which look drawn, so they aren't perfectly straight. This, for some reason, makes all the difference in the world. I like the look of them, whereas if they were perfectly straight, I would find them annoying. It's amazing the difference such small details make. There is a card number in the upper right corner and a playing card insert, top center. I love the font used for the numbers and suit symbols, and the court card images are very charming. There are no titles on the cards, which I love. I feel if a Lenormand deck is done right, the card imagery should be obvious without the need for distracting titles. The backgrounds of the cards are antiquated, which adds yet another thing to love about the deck. Some cards even appear as though there are creases in them, and quite believable! On each card, there is a single color featured, used for the illustration, border, number and playing card insert. I really like the seamless monochrome look this gives each card. There are 38 cards in the normal deck, including 36 traditional cards, with an extra Man and Lady card. I have the Halloween Special Edition deck (which I believe is only available to purchase every October) which gives you another two additional people cards (Witch and Vampire). My Halloween edition also came with a tuck box featuring a skeleton on it. It is adorable, though the way it is printed always has me trying to open it upside down. I don't know what the regular edition box looks like. The Man and Lady cards are all dressed up in costume, to match the theme of the deck. I just adore this! 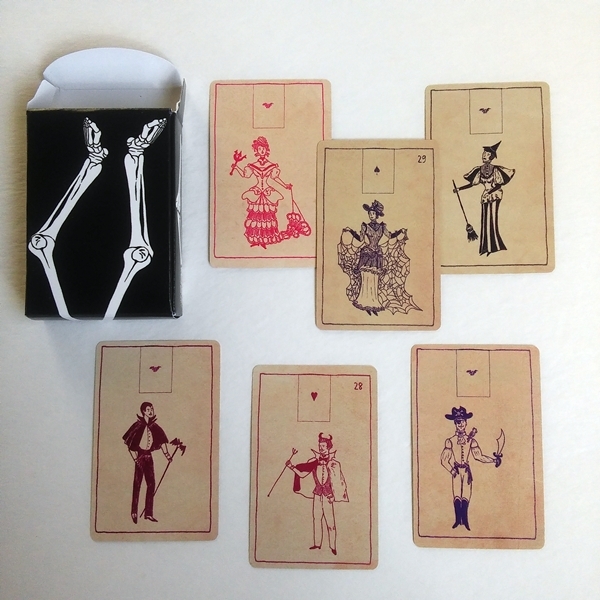 The Men cards are more obviously dressed in recognizable costumes (Devil and Pirate) while the Lady cards are less costumed (one with a spiderweb shawl, and another holding a pitchfork, but otherwise normally dressed in Victorian looking dresses). The Devil Man and Spiderweb Lady are marked with card numbers and a single suit symbol, while the two extra people cards are unnumbered, with a bat where the suit symbol would be. If you are using two of the same gender cards in a reading, this allows you to easily distinguish between the querent's card and his/her love interest. The Ship is being attacked by a kraken, which I love! The Moon features a werewolf. The Fish are creepy and weird (in the most wonderful way). The Clouds are ghosts! The Fox is at someone's door, trick-or-treating, wearing a mask, which is such a perfect take on this card. A jack o'lantern serves as a vase for the Bouquet. The House is a haunted house. Laying across the Anchor is a skeletonized mermaid! The Birds card is gorgeously gothic, with black birds swarming a skull. And the Stars card is really pretty, with a witch on a broom. I could literally discuss every single card in the deck, because I love them all. Every card is as charming as the next. The only card I have trouble with is the Garden, because I can't quite make out what the figure in it is meant to be. An angel? The deck is filled with nostalgia and happy Halloween childhood memories. There is no accompanying LWB for this deck. In my opinion, a Lenormand deck doesn't need one, because you either know how to read them, or if you are a beginner, you need to learn a system, which can't be contained in a LWB. The first reading I did with this deck was regarding a flat tire. I wanted to know if the tire company would fix the flat for free. I drew Moon (big famous tire company) + Mountain + Snake (Obstacle with the inner tube) + Fish + Ring (honoring a monetary commitment - warranty). It looked like the answer was yes. A few hours later, this was confirmed as they did indeed fix the flat for free. The next day for my daily draw I drew Mountain + Stars + Ring. A regular shift was taken away from me, because a client no longer needed our agency's service. Mountain + Stars was an obstacle to "a lot" of something (as I often see the Stars). In this case, it represented a lot of hours in my work schedule. The Ring promised my hours would be replaced with a new client commitment, and indeed my hours were quickly filled in with another client. The next day I drew Mountain + Cross + Crossroads. That day I ended up pushing a client in a wheelchair up small hills (Mountain) and down long roads (Crossroads). It was hard work on my back (Cross)! The next day my cards were Mountain + Coffin + Fish. (So far, the Mountain had appeared in every reading I had done with this deck, and it was the third day in a row that my reading started with the Mountain card). This reading showed me an end to money obstacles. That day, I got an extra few hours of work on my schedule. Next day was Clouds + Snake + Fish + Bouquet + Fox. A couple weeks prior to this reading, a friend said he was sending me birthday money. It had not yet arrived. These cards seemed to address this issue. Fish + Bouquet was the gift of money. Clouds showed it hidden from my sight. The Fish/Bouquet is surrouned by Snake and Fox, leading me to believe the letter had taken a detour, and possibly even delivered to the wrong address. I decided to wait a week, and if it hadn't arrived, to do another reading on the issue. But the next day, the cards brought the subject up again. I drew Fish + Bear + Fox + House + Anchor. It looked like the cards were telling me that it would be delivered that day! And sure enough, just a few hours later, the mail arrived, containing the birthday money gift from my friend! The last reading of the week, I drew Coffin + Sun + Heart. It was my first day off after three 13-hour overnight shifts in a row, the last night being particularly grueling. I was sooooo tired. Coffin + Sun accurately described my staying in bed all day long. Heart told me to do what I loved that day, as long as it could be done from bed (Netflix, Instagram and books). This deck gave me very accurate readings. It lends a light-hearted feel to readings without compromising the integrity of the message. I've really enjoyed working with these cards. I am a huge fan of the Halloween season, so this deck is right up my alley. The illustrations are beautifully and creatively done and the colors fit the season very well. The deck is fun and family-friendly. 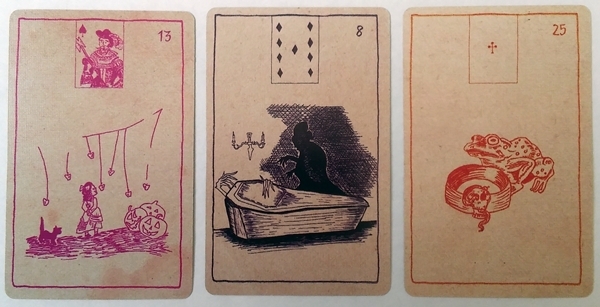 If you are a Lenormand reader and a fan of Halloween, this deck is honestly a must-have. You will definitely want to get it out in October, but I myself will be using it year-round because I don't limit my spookiness to one time of year. 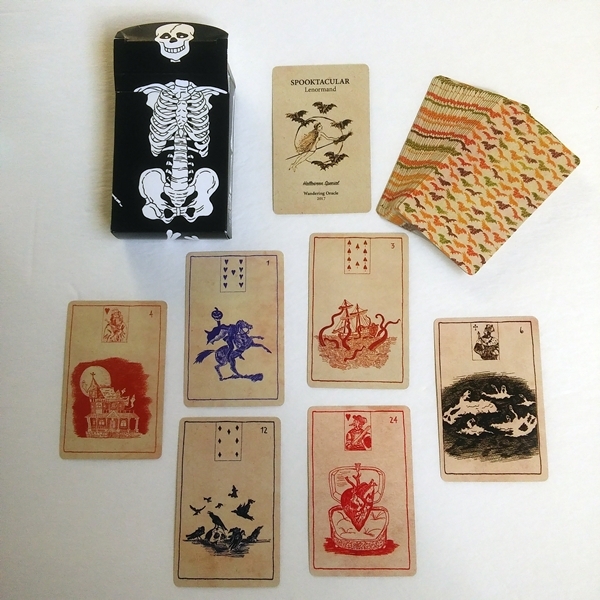 Deck: Spooktacular Lenormand by Wandering Oracle.